It was at the beginning of the 50s, when there were many theatrical and musical events springing up all over Europe, that the Dubrovnik Summer Festival was founded. However, the idea of harmonizing the renaissance and baroque atmosphere of Dubrovnik and the living spirit of drama and music, actually derived from the intellectual way of life of the city itself, from its living creative tradition, which has bestowed upon Croatian cultural and scholarly history, especially in theatre and literature, many great names and works, and kept it continually in touch with contemporary currents in western Europe. 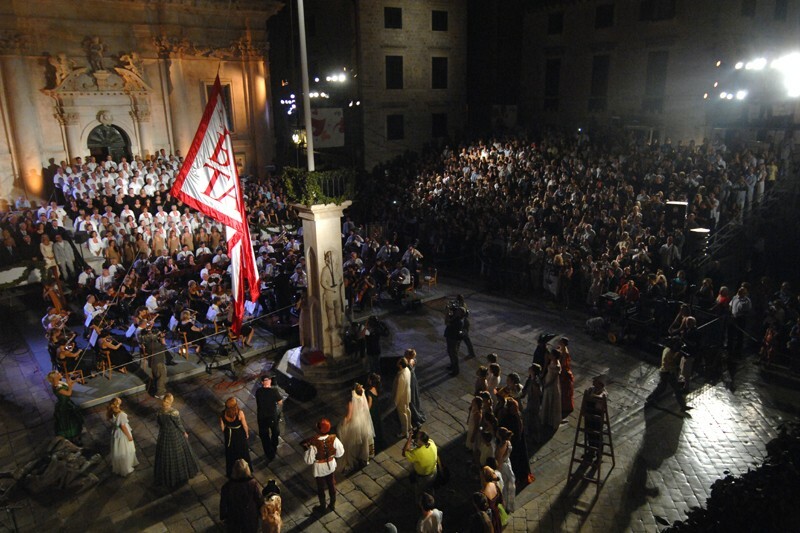 The works of Marin Držić, Nikola Nalješković, Ivan Gundulić and Ivo Vojnović were to become a mainstay of the drama programme, then, while with the understanding of the idea of the importance of ambience, which is the principal distinguishing feature of the Dubrovnik Festival, the specific theatrical values of the wider Croatian dramatic heritage gradually became revealed, as did the adaptability of the classics of European dramatic art to the squares, palaces, towers and parks of Dubrovnik. Above all Shakespeare, but also Goldoni, the Greek tragedians, Molière, Corneille and Goethe became yardsticks of the traditionalist nature of the festival. As early as 1952 director Marko Fotez, the prime mover behind the group of enthusiasts who started up the Festival, put on Hamlet at the Lovrjenac Fort, which soon became an ideal setting for this drama known throughout the world. Equally attractive were the performances of Goldonis Fishermens Quarrels in the old city harbour, renaissance comedies and mystery plays taking place in the city squares (called after Gundulić, Bunić and Držić), Goethes Iphigenia, staged in Gradac Park by Croatias greatest director Branko Gavella, and Vojnovićs The Trilogy of Dubrovnik, an emblematic work about the fall of the Dubrovnik Republic, staged in the authentic rooms of the Rectors Palace, Sponza Palace and Gruž summer residence. The ambience determined not only the repertoire but also the organization of the festival, and most of the performances were performed by the Festival Drama Ensemble, composed of the best Croatian actors. There were also guest appearances that enhanced exclusiveness of the event including the Piccolo Teatro from Milan with Strehlers staging of The Servant of Two Masters, the Old Vic with Zefirellis Romeo and Juliet, the Greek National Theatre from Athens with Aeschyluss Prometheus Bound, the Stadttheater from Basel with Dürrenmatts Play Strindberg, directed by the author, Ronconis legendary staging of Orlando Furioso, the London Prospect Theatre Company with several productions by Toby Robertson, and the Teatar Stary from Krakow with Wajdas The Idiot; Hamlet has been played by prestigious actors such as Derek Jacobi and Daniel Day Lewis. In the early seventies the unconventional dramatic forms were gradually introduced, with groups like the Schumann Bread and Puppet Theatre, the Amsterdam Dogtroep, Els Comediants from Barcelona, the Compagnie Ferrucio Soleri and La Mama Theatre from New York taking part. But the key modernistic excursions of the festival were still determined by shifts in the posited poetics of the setting, either by including works of contemporary writers like Bond, Brecht or Krleža, or by including new venues on the city map, over forty of them, where, in addition to the best Croatian directors, well known international artists such as Stuart Burge, Denis Carrey, William Gaskill and Jiři Menzel have also worked. The festival music programme was initially conceptualised as presentation of the best composers, soloists and orchestras from the country, but by the end of the fifties it had already grown into a real review of top solo artists and ensembles from all around the world. The high standard of performance in Dubrovnik was complemented by functional use of the attractive and acoustic buildings, particularly the Rectors Palace Atrium. In the early seventies special attention was paid to the music and concert programme conception, with larger number of representatives of new currents in music taking part, in addition to those who attempted to breathe new life into the old, especially Croatian, music. Among numerous artists who performed at the Dubrovnik Summer Festival, contributing to its prestige worldwide, it is difficult to single out anyone in particular. For the sake of illustration, when big orchestras are concerned, in addition to regular appearances of the Zagreb Philharmonic, let us mention the Czech Philharmonic, the Halle Orchestra, the French Radio Orchestra, the Suisse Romande Orchestra, the RAI Symphony Orchestra from Turin, philharmonic orchestras from London, Vienna, Dresden, Berlin, Moscow, Warsaw, St Petersburg, and the Cincinnati Symphony; among chamber and vocal ensembles the Beethoven Quartet, Borodin Quartet and Prokofiev Quartet from Moscow, the Lasalle Quartet and Juilliard Quartet from New York, the Amadeus Quartet from London, the Parrenin Quartet from Paris, the New Vienna Quartet and Alban Berg Quartet from Vienna, the Virtuosi di Roma, the Zagreb Soloists, the Lucerne Festival Strings, the Academy of St Martin in the Fields, the Vienna Boys, the Beaux Arts Trio from New York, the Prague Chamber Orchestra and many others. Among piano soloists taking part were Svyatoslav Richter, Vladimir Ashkenazy, Nikita Magaloff, Van Cliburn, Martha Argerich, Rudolf Firkusny, Alexis Weissenberg, Aldo Ciccolini, Claudio Arrau, Mihail Pletnov and Ivo Pogorelić, flutist James Galway, violinists Henry Szeryng, Leonid Kogan, Isaac Stern, David Oistrakh, Viktor Tretiakov, Zlatko Baloković and Uto Ughi, as well as cellists Rostropovich, Navarra, Janigro and Tortellier. Great singers like Nicolai Gedda and Monserrat Caballe have also performed at the festival, as well as star performers like Duke Ellington, Dizzy Gillespie and Ravi Shankar. The history of operatic performances began in 1951, when the Sarajevo Opera made a guest appearance with five of its productions. The period up to 1963 was characteristic of guest appearances mainly of opera houses from the then state, but also of the search for venues suitable for staging of operas. In 1964 the first festival opera production Monteverdis The Coronation of Poppea, directed and conducted by Lovro Matačić, was put on in front of the Rectors Palace. However the best way of getting Dubrovnik and the opera together was found in 1971, and chamber operas, mostly comic, have been staged in the atrium of the Rectors Palace since. In addition to the festival performances of works by Monteverdi, Pergolesi, Caldara, Cimarosa, Salieri, Telemann or Galuppi, the practice of having guest opera performances continued, including those by the Opera of the Croatian National Theatre from Zagreb, the Teatro Massimo from Palermo, the Piccolo Teatro Musicale from Rome, the Phoenix Opera from London, and the Moscow Chamber Music Theatre. The festivals history also notes several exclusive operatic events like the performance of Kelemens Apocalyptica, or the attempt to reconstruct one of Jarnovićs operas, as was the project Abroad and at Home. Ballet and dance have also been welcome guests at the Dubrovnik Summer Festival, which was confirmed by the series of famous names and groups presenting their projects on the terrace of the Revelin Fort. Alongside the best local troupes, choreographers and soloists, Dubrovnik has been visited by Merce Cunningham, Jerome Robbins, Alvin Ailey, Glenn Tetley and Martha Graham and their companies, the Twentieth Century Ballet of Maurice Bejart, the American Ballet Theatre, the London Festival Ballet, the Harkness Ballet, the Antonio Gades troupe, the ballet of the Hungarian State Opera, and ballets from the cities of Parma, Antwerp and Adelaide.